I have put my hair through so much over the years, I feel now it's time to be kind and gentle to it or else I'm going to be left with no hair! I've been dying my hair since I was young and it's always been the strong stuff (bleach, not actual bleach). I tend to not use heat on my hair everyday as that is what kills it the most. When I wash my hair I try to let it dry naturally, plus I like the way it goes when it dries naturally as when I hair dry it it tends to go poker straight and I'm not a fan of straight hair, I tend to like the 'just got out of bed' hair look. 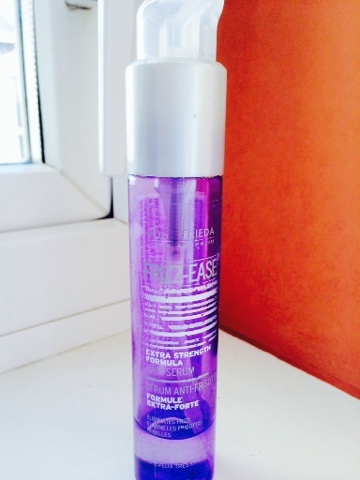 So when it has dried naturally, just before I style it I pop a pea size drop of this John Frieda Frizz-Ease Serum. It has been in my life for years and years and it is one product I swear by and couldn't live without. I honestly don't know how you guys live without a serum!!!! If you've never used one then I suggest you go out and buy this one and use it for a month and see how much it changes your life. It smoothes down those frizzy strands, makes it shiny and soft and just overall looks in better condition. Don't apply too much as it can make it look greasy and only apply it to the tips! There are three types if these John Frieda Serums and I don't see the difference as I've tried all three but they all are just as good as each other. They come in at around £7 but well worth it. I recently bought this Extra Strength Formula as I thought it may go further if I didn't need to use as much but to be honest it is just the same. If you use hair straighteners and hair dryers then I would apply this before you do so so it protects your locks against the heat. 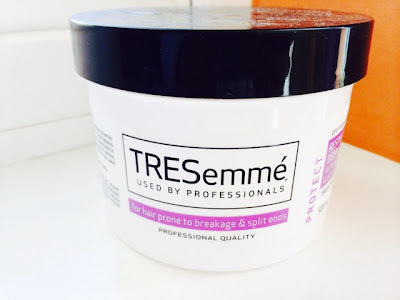 Onto this Tresemme Hair Mask. I've never used a mask before and I seriously don't no why. I love them! Or maybe just this one, but I'm guessing they all do the same. Left this on wet hair for 5mins and it didn't feel as soft as I thought it would and even not any different. But when I let it dry, wowza. It was so soft, maybe a little too soft so I wouldn't use this before you go to a especial occasion and you have to style your hair as we all know it's a nightmare to style your hair when it's too soft, it just doesn't happen. I maybe don't do this mask as much as I should. Superdrug do special offers on Trememme products quite a lot so I would check there first if you go to buy this. What other hair products should I try?